With Quinton de Kock dismissed early in the innings, the onus was on Suryakumar Yadav and Rohit Sharma to resurrect the Mumbai Indians’ innings. But Rohit could not make an impression and was soon followed by Yuvraj Singh back to the pavilion. Krunal Pandya and Suryakumar had the task of rebuilding the MI innings. Used as an opener last year, Suryakumar had impressed with his risk-free approach at the crease. He topped the run charts last year for Mumbai Indians, making 512 runs in 14 matches at an average of 36.57. The season was a massive anomaly to his usual record. He had never made over 200 runs in a single IPL season until then, although the fact that he batted in the lower middle-order played a role in this. Suryakumar has just taken off from last year. Till 2018 he had just scored one half-century in the IPL but in the last couple of seasons, he has as many as five. This year, with Rohit Sharma choosing to open the innings, Suryakumar has been used in a damage control anchor role at no 3 and on Wednesday (3rd April), he did that to perfection but in addition also counter attacked CSK. A series of boundaries took him to 24 in 12 balls at a strike rate of 200 but he subsequently slowed down. His next 24 balls brought just 22 runs as Krunal Pandya took over the striking duties. The Krunal - Suryakumar stand lasted eight overs and Krunal scored the bulk of the runs - 42 out of 62. 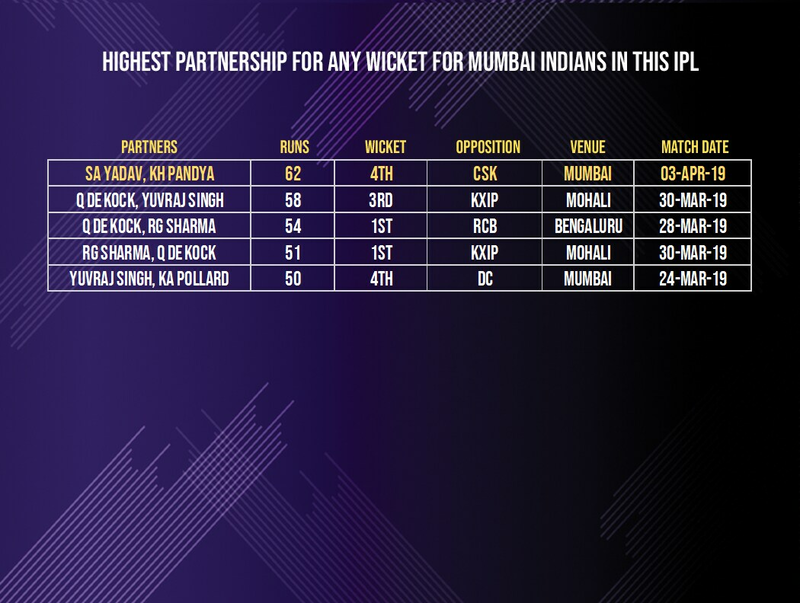 The partnership is Mumbai's best of the season. Suryakumar, on his part, completed a fine half-century. He had made scores of 43 and 44 last year against CSK but this time managed to convert his start courtesy some lusty blows at the end. His strike rate is significantly higher than last year and from a crucial no.3 position. Suryakumar has an opportunity to dictate the passage of play in the middle overs in this edition. From a finisher at Kolkata Knight Riders to an opener last year to the batting anchor in the middle-order this time around, Suryakumar has been showcasing his versatility and adaptability in the IPL.